US forces said Friday that two civilians had died in an airstrike in Somalia, the first time it has admitted non-combatant deaths since launching a wave of missiles targeting jihadist fighters. But the admission of deaths by US force marks a notable shift in a previous blanket denial of any civilian killings. 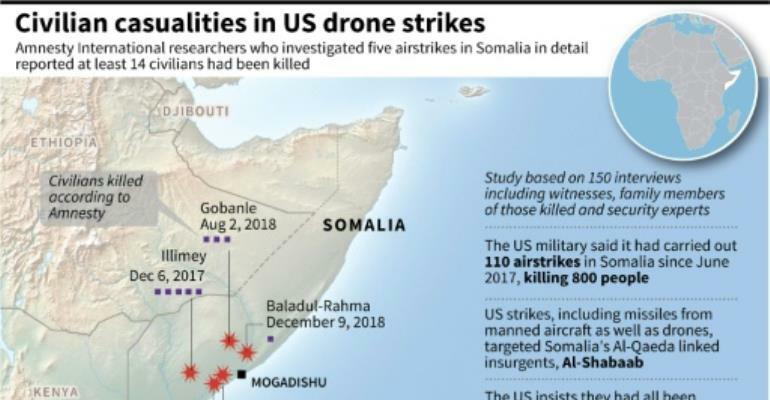 US strikes, which included missiles fired by manned aircraft as well as drones, targeted Somalia's Al-Qaeda linked jihadist insurgents, Al-Shabaab. Following Amnesty's claims in March, the US Africa Command, AFRICOM, said it killed over 800 people in a total of 110 airstrikes in Somalia since April 2017, but insisted every death was that of a "terrorist." On Friday, however, the US military said in a statement that they had now found two civilians had been killed in an airstrike last year, in Somalia's central El Burr regin. "An April 1, 2018 airstrike killed two civilians," the statement read. At the time, on April 2, 2018, the US had said no civilians were killed, but that five Al-Shabaab had died. On Friday, it said four Shabaab fighters died. No further details of the civilians killed by the US missiles were given. The rate of airstrikes has also risen sharply. The 110 attacks the US said it has carried out since April 2017 includes 28 airstrikes in 2019 alone, compared to 47 in all of 2018, and 35 in 2017.